We don’t review headphones that often at Overclockers.com, even though they can be an important part of any good gaming or audio/video-focussed PC. When we do, they are usually open headphones, particularly a certain gold and purple set. Open headphones have plenty of benefits, but the one place where they fall behind is isolation. Not only do they dish out second hand music like it’s nobody’s business, but you can also hear the person yelling at you to turn it down, amongst other things. Luckily, the industry caught on to this a long time ago, and that’s why closed headphones exist. But uh, don’t quote me on that. What you can quote me on is that the best benefit of closed headphones is isolation. Personally, I don’t see the point in a closed headphone without isolation, as that means you are usually getting the drawbacks of a closed headphone (more on that later), without the benefits. Lo and behold the headphone we have today is not only closed, but knows how to isolate as well! 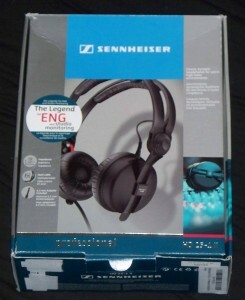 So, without any further typing let’s get to reviewing the Sennheiser HD 25-1 IIs. They came in a slightly small box. Inside there is… well not that much. The only things worth note are an extra set of pads and the 1/4″ adapter, but the latter is already on the plug. The headphones themselves are surprisingly light. At first they seem a bit finicky with the cups moving about on their own, but after a little time you learn that it’s actually very well built. Not only are they quite durable, but you can also buy every part on it’s own, so if something breaks you can just pay for the broken bit instead of the whole thing. The only thing that seems breakable on these headphones is where the plug meets the cups. Under normal use there is no stress on these at all, but if you happen to sleep with headphones on (like I do, every night), then you can put pressure on these and after a while they can develop problems. Mine have had problems for a while now, but it always just takes a wiggle at the plug to fix them. They don’t seem able to completely break off, so although it can cause problems it doesn’t seem like it would ever be necessary to replace the cups, unless it just really annoyed you. The end plug also looks very well built as well. You can’t beat the HD 25-1 IIs for portable use, unless you really like IEMs. Personally I can’t stand the things so the HD 25s win. Now, of course, the fun part: the sound. When most people start talking about the sound of closed headphones, they generally go on about tons of bloated, flabby bass, mids that only seem to exist in different dimensions, and ‘rolled off’ highs. Coincidentally ‘rolled off’ can be used to describe anyone who just said that around me, as they usually find them selves inside a garbage bin being rolled down a pleasantly grassy hill. That said there are closed headphones that fit that bill to a T…er, maybe a B? Hmm. Anyway, and I’ve used a few of them and they were all disappointingly bad. 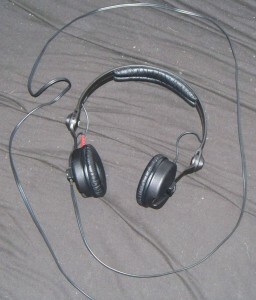 However, most higher end closed headphones like the HD 25-1 II don’t suffer from these problems. They do have bass, and at the time I had come off of using nothing but AD700s for a few months so it was a big change at first. It’s not massive basshead bass, and it doesn’t seep into the mids and highs, but it does have some weight behind it. I’d say it’s probably a bit emphasized, but overall pretty neutral. The mids and the highs are actually pretty similar to the AD700s, obviously since there is bass the tone is focused more on the low mids rather than the high mids of the AD700s, but otherwise it’s basically the same. There is a bit more detail in the HD 25s, not all that much but definitely a step up. The one thing the HD 25s don’t do as well as the AD700s is soundstage. 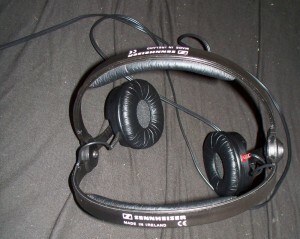 You don’t really notice it going to the HD 25s from the AD700s, but when you put on the AD700s after listening to the Sennheisers for a while, it’s quite noticeable. If you are a soundstage nut or listen to a lot of music that relies on soundstage (classical, for exmaple), then this can be a problem. The trade off of this is that they have a rather up front sound, like having the whole band playing somewhat close to you. For genres that do well with this (rock, for example), the result is that it sounds very, very good. The other place where the AD700s might have an advantage is resistance. The AD700s are 32 ohm and will run easily and to a good volume on any mp3 player, but the HD 25-1 IIs are 70 ohms and take a little more power to get to decent volumes. I have no problem driving it on my Cowon X5L (that happens to be 20 mW+20 mW, for reference). My Sansa clip+ takes a little more volume and can only drive it up to right about the max listening level, still fine but I happen use headphones as a car stereo and the little clip can’t drive them to “small speaker” level. One important thing to note when buying, is that the HD 25s are the Porsche 911 of the headphone world. There are a bunch of different models and they are all a bit different. The HD-25 SP uses different drivers and a different headband, so I’d recommend you stay away from them. The HD 25-1 (the sans “II” version) is also best avoided as it doesn’t have the extra pads. When you are buying, make sure you get the 25-1 II. The proper HD 25-1 II can be had for around 160$ if you don’t mind waiting a little for a good deal to come up. When I bought mine they were 160$ at amazon but at the time of writing they are around 190$. Although they are ok at that price, they are a much better deal at 160$.